Controversial Teamster leader Jimmy Hoffa was reported missing on July 31, 1975 after vanishing from a restaurant parking lot in Detroit, Michigan the previous day. The circumstances surrounding his disappearance still remain a mystery and have made Hoffa a permanent fixture of American folklore. Jimmy Hoffa showed exceptional leadership skills from a very young age. The son of a coal miner, he helped organize his first labor strike in Detroit when he was twenty years old. Hoffa’s remarkable talent and charisma did not go unnoticed by the local Teamsters union, and he quickly rose through the organization’s ranks. The Teamsters organized truck drivers across the country and negotiated contract demands on behalf of the workers through legitimate means such as strikes and boycotts – and some methods a little more on the shady side. Hoffa was wildly popular with his workers and many of the businessmen and politicians he negotiated with. He also worked hand-in-glove with high-ranking Mafioso; dealing with the most notorious mobsters of the time was just another day at the office for him. During John F. Kennedy’s presidency, Attorney General Robert F. Kennedy was well aware of Hoffa’s ties to the Mafia and was determined to put him away as part of his crack-down on organized crime. In due course, Hoffa was convicted of jury tampering and improper use of Teamster pension funds. He exhausted all his appeals in 1967 and began to serve out his eight-year sentence. In 1971, President Nixon pardoned and released Hoffa, commuting his sentence to time served on the condition that he could not participate in Teamster activities for ten years. So Jimmy was free, but (supposedly) locked out of the Teamsters. He appealed the conditions of his pardon, and contacted his old supporters in an obvious bid to retake control of the union as soon as he was legally able. And that looked like a very real possibility. Hoffa still had an incredible amount of pull within the organization. Then, when he was scheduled to meet two Mafia leaders – Anthony Giacolone from Detroit, and Anthony Provenzano from New York City, for lunch, he vanished without a trace. Over the years, there have been many reports speculating where Hoffa’s body is located, but none have panned out. As to the “why” of Hoffa’s death, most people assume that Hoffa’s return to the Teamsters was a threat to the mob, so they bumped him off before he could become a headache. 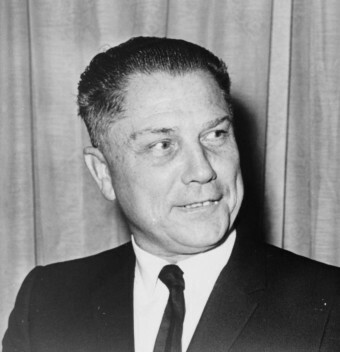 Seven years to the day after his disappearance, Jimmy Hoffa was declared legally dead. The president of the International Brotherhood of Teamsters today is James P. Hoffa, Jimmy’s son. Thanks for this interesting, well-written article.